Beverly's Official Blog | News and findings from world of crafts, scrapbooking and more: Cherry Fabrics and Cute Aprons! 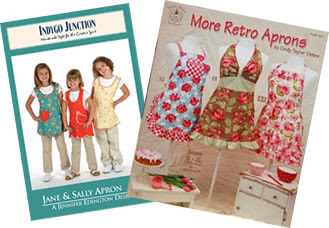 Cherry Fabrics and Cute Aprons! What a combo! Dana from our Soquel store came up with these cuties using Jane & Sally Apron Pattern by Indygo Junction and More Retro Aprons by Cindy Taylor Oates for inspiration. The cherry fabrics are from Timeless Treasures, Michael Miller, Moda, Wilmington Prints and more.